The "mother of all deflations" may be quickly approaching as the nation's housing market loses steam at a quickening pace. Despite talk of a soft landing from real estate professionals and economists, observers are well advised to stand clear as touch-down approaches. Indeed, if present trends continue, the nation's number one economist, Fed Chairman Ben Bernanke, may be well advised to begin work at managing "deflation" expectations, rather than obsessing over whether the core rate of "inflation" is a quarter point too high. Given the current slope of the blue line below, and its unlikely flattening at a rate of change that all economists love - two percent - there are potentially much bigger problems ahead than whether poll respondents believe gasoline prices will rise further in the year ahead. All the recent talk about "inflation", as measured by the various consumer price indexes, has distracted many from the most important 'flation of them all - housing. While the rise and fall of home prices may not be deemed worthy of the inflation and deflation monikers at the Bureau of Labor Statistics, that doesn't mean that they aren't important. And, that doesn't mean you can't talk about housing deflation - if for no other reason than to get the attention of people who should be concerned about this potential development. 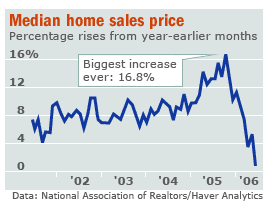 Housing prices have been the most important of all prices in recent years - even more important than the price of oil. For the last three years, the entire world economy has been powered by the American consumption of imported goods, enabled by ever-higher U.S. housing prices. No housing price rise, no rise in consumer spending, and a booming world economy quickly sputters. This was Alan Greenspan's gift to Ben Bernanke. Whether you define 'flation as an economist does, using questionable government price indexes, or if you prefer the Merriam-Webster view that price changes are merely the result of the expansion and contraction in both money and credit and real 'flation lies there, in today's bubble economy, management is definitely required. When prices are rising, care must be taken that they not rise too fast. Consumers will notice the quickening pace of price increases and step up their purchases to avoid watching their money lose value. This creates an overheated economy that must be cooled. Inflation expectations are managed by restricting credit, raising interest rates, and talking a lot about being vigilant, so as to dampen economic activity, bringing prices back in line with long-term trends. When prices are falling however, the opposite is true. Consumers will notice the decline in price levels, and hence the increasing value of their money, and defer purchases in the hopes of getting a better bargain in the future. Deflation expectations must be dealt with by opening the money and credit spigots wide, so as to convince would-be savers that their money is better spent than kept. Economic activity increases with the higher level of spending and prices return to long-term trends. But when some prices rise and some prices fall, the 'flation expectations management business becomes difficult. When the cost of energy and services increase while the price of homes decrease, what is the manager to do? Make money and credit tighter or looser? It seems the two 'flations, and how both the American consumer and makers of monetary policy view them, are opposing forces in our bubble economy - an economy that is not so easily controlled anymore. How does one go about seeing that certain prices don't rise too much and others don't fall too much? That, clearly, is a question that keeps Ben Bernanke up late at night - how to manage both inflation and deflation expectations. I doubt Bernanke's inability to control where the money goes will prevent him from inflating, anyway. This lack of control certainly didn't stop Greenspan, right? If Greenspan was still reigning king, what bubble would he start to get us out of this? I guess that's why he retired! For the life of me, I can't figure out why anyone would willingly take that job after Greenspan, let alone campaign for it as Bernanke did. As I believe Tim has pointed out in a previous post, it's not like he's saving a hundred mil on taxes like Paulson at Treasury. He must either be naive, full of hubris, or some combination of the two to think that he's anything but Greenie's fall-guy. It's in the banks' best interest to raise rates to the point of pain. That is, keep most people in the game (paying their mortgages at increased interest percentage rates), while keeping defaults as low as possible (or taking as much as they can when the banks do foreclose - new bankruptcy laws), or shuffling those bad loans off to some other schlub (Fannie, Freddie, etc.). Basically, there's not a huge incentive for Ben to lower interest rates, right? They've already gotten the American consumers fully sucked in, so controlled deflation of home prices won't matter as much since they'll be getting higher and higher interest payments over the next few years. Inflation of goods/services is very positive for large corporations that generate these goods/services, so you wouldn't want to deflate these or you'd risk angering the only people with the means (bought lawmakers) to stop you. Does this make sense, or am I barking up the wrong tree? The FED cannot control energy, the weather, and other important factors. Energy is more expensive across the board, food is getting more expensive and scarcer and harder to grow due to the hotter and dryer weather / energy prices. Good land is more scarce due to increasing population so the price goes up. They (the US Gov't) have so little control anymore. Not that they are not trying. The Repos are huge. The PPT is hard at work. I think this is going to cream the state and local gov'ts because they will bear the brunt of the expenses of the civil unrest / social support while tax revenues fall. And there can be no Fed bailout because they are also broke. Maybe the powers that be realized they need scape-guy/fall-goat so they allowed an academic into a position requiring godlike amounts of political savvy. Much is made of Bernanke's "academic credentials, but remember, he was on the Fed Board of Governors from 2002-2005. Besides, business and economics profs routinely rake in most of their money by consulting major corporations on their policies, and impacting real world economics. Business/Economics academia is not so removed from the real world. Likewise, I think the Chairman of the President's Council of Economic Advisers probably has heaps political savvy. I think people underestimate Bernanke. I don't think he'd jump into a position as a fall guy unless he was heavily incented to. I think it's more likely that he has some sort of workable plan. And putting a wall street crook in charge of the printing presses after handing him a $100M tax "bonus". The founding fathers would not recognize the place. "The founding fathers would not recognize the place." Yes they would...it is the place they left-to start a new country. As Rothbard has pointed out, mild deflation is actually a good thing. In fact, this situation prevailed in the US from its founding until 1913 (and we all know what happened then). Deflation as modernly understood is disastrous precisely because of fiat currency. When currency is sound, deflation has absolutely no implications of economic recession or depression. As pointed out above, a gradually rising value of the currency dissuades spending. However, at a mild rate of deflation, this effect would only discourage spending that (1) isn't necessary consumption, and (2) isn't based on truly compelling investments. I find the latter particularly interesting, because it means the financial world will have to work harder to convince people to part with their hard-earned money and put it into various securities markets. This would be a very good thing. Another point is that deflation automatically redistributes society's wealth from the rich to the non-rich. That is, under deflation most folks would make more and real money from year to year, and any surplus they have saved up would actually grow in value by default. Thus, both cash flow and savings are automatically improved, eliminating much of the need for government to engineer the economy and supply welfare. Of course, the truly shrewd and productive rich would still get along fine. But the marginal folks: the rich who get that way based on too much liquidity, and the poor who can't get anywhere in the game due to inflationary effects, would be minimized. Enter the Fed, and those days were over. All that said, the kind of catastrophic, sudden deflation we face now is of course a different beast and is indeed bad. But mild deflation, which portends bad things only in a fiat currency regime, is quite good on a sound money basis. fanstastic post aaron, I would add that gov'ts also stopped taking debt seriously. anyways, have you read john steele gordon's book hamilton's blessing? you should pick it up, it's an easy read and gives a quick 200 page history of the debt. it has small pages so it's basically 100 pages. May I commend to you David Hackett Fischer's "The Great Wave," which you can read about on amazon better than I could summarize it. Most people don't know any history, and seem to think things can only get better, especially for us, God's preffered country. Why shouln't the rest of the world finance our debt and work for a dollar a day so we can leverage our houses to the max, lower our taxes and enjoy life? I saw some comments about how gov't is going to fix it. They can fix it by staying the heck out of the way. Seriously, please name one gov't program that in the long run was a success. Just have the gov't do what the Constitution says to do. When you read the Constitution, it doesn't say to do much. Imagine that. A country founded by folks who distrusted the previous gov't/royalty. It would stand to reason they would want a gov't to do the absolute bare minimum. That is not what we have today. I don't want some lifetime politician deciding how much my dollar/hour of work/gallon of gas is going to be. How the hell would he know? He lives literally like royalty. Raising rates to fight inflation? It is political speak for trying to induce a mild bout of bankruptcy. That is how you get a negative expansion of the money supply since the FED is constantly expanding the money supply. Can the FED actually say that? Not unless they want to be run out of town, but that is what they are hoping for with a soft landing. Maybe they can get the number of defaults just right without triggering cascading defaults. That is exactly what they are praying for. Good Luck. Good thing we've got central planners attempting to run our's, and the world's, economy. Ben took the job to be the fall guy. So he wrecks everything and guess who comes in to save it? Easy Al comes a calling with Ben's helicopters and poors cash apon us after Ben deflates it and the cycle starts again. Al becomes a hero, Ben a zero. Things are "fixed" and life goes on. I don't see how deflation benefits the poor more than the rich. Poor people are more likely to be net debtors. Inflation helps a debtor. After the last 6 years, I can't bear statements that government is the root of all problems. Government can be incredibly bad and stupid, but so can private business and individual citizens. Some countries with large government roles, such as Sweden or Singapore, do incredibly well, while others, say, North Korea do horribly. Please, let's not reduce economic performance to: government -- bad, business -- good. It would be nice if things were that simple. Speaking of good government programs, I would argue that Social Security and Medicare have been very successful, given the alternative – millions of really destitute old people. Also, most scientific and medical research is financed by governments in the US and other countries. And let's stop referring to some golden age before 1913 when everything was wonderful - if we look at statistics more meaningful than inflation/deflation rate, such as infant mortality, life expectancy and malnutrition rates -- they were much worse than now. Obviously, I don't credit the creation of the Fed for these improvements, just saying it's easy to idealize the past, particularly sufficiently long ago that no that living relative remembers it. Speaking of good government programs, I would argue that Social Security and Medicare have been very successful, given the alternative – millions of really destitute old people. If you earned a dollar in 1940 and held it for 66 years only to find out that it was now worth only a small fraction of it's original buying power and found out that the reason for this loss in value was the Fed, what would you do? Isn't theft defined as the coercive taking of someone else's value? Isn't that what the Fed has done? You talk about "after the last 6 years" as if the past six years should have given us renewed confidence in the government. So please share why we should feel that way. If you earned a dollar in 1940 and held it for 66 years only to find out that it was now worth only a small fraction of it's original buying power and found out that the reason for this loss in value was the Fed, what would you do? Buy gold? There are alternatives to the dollar if you really truly want them. Of course, if you invested that dollar in somthing even as conservative as savings bonds it wouldn't still just be a dollar 66 years later, right? You only really need dollars for paying taxes, technically. Isn't theft defined as the coercive taking of someone else's value? If you sit down at a resturaunt and order food, you have to pay for it. There's an implied contract from sitting in a resturaunt and ordering food. Same with living in the US. The government has certain rights that ordinary citizens don't, including taxation. It seems to me that some inflation of the money supply is a very fair form of taxation. It reduces debts. It taxes savings. It isn't ammenable to people cheating on their tax returns. Provided that it's moderate enough that people stay in the game, it seems a lot fairer than most taxes. 1. Public Health: Try googling typhoid, dyptheria and cholera in US History for an explanation of what happens when governments can't be bothered to provide basic sanitation. 2. Interstate highways: In adjusted dollars probaly the largest peacetime government expenditure ever (correct me if I'm wrong). Take them away and our way of life would vanish in 72 hours. 3. The GI Bill: Launched the affluent society and showed that every aspect of society benefits when you invest in education. 4. National Weather Service: Katrina was bad, Galveston was much, much worse. What I find interesting is that we consistenly elect politicians who would starve or privatize every benificial service of government. If we keep this up we will get the small government we truly deserve. If you sit down at a resturaunt and order food, you have to pay for it. This analogy is a bit off re: government. When you go to a restaurant, you choose to receive their services. This is done at your own volition. Government coerces you into paying taxes. I think you're also, in my view mistakenly, making the implicit assumption that your taxes equate to services that you would pay the same price for if those services were sold on the free market. However, this doesn't seem to make sense with thte economic reality that monopolies (Governments) are in no way incentivized to compete and provide services at lower prices. I disagree that inflation is at all a "fair" tax. However, arguing that point would probably not be very useful. That said, with income taxes individuals are at least keenly aware of the taxes they pay. Inflation is a sinister tax because it is so difficult, if not impossible, to see. Why can't government's tie the services they provide to the taxes they collect? Is it that difficult? Their refusal to do just that is just more evidence of why governments are so inefficient (and why the restaurant analogy is incorrect). I have seen nothing to support the position that our government is making the market more free. It seems like the opposite of that is happening (Just look at Sarbanes-Oxley, for example). However, I hope you're right: I would love to get the "small government we truly deserve." Government coerces you into paying taxes. Only if you stay here. There's a free market when it comes to countries. You could go somewhere else. Why are so many Mexicans coming to the US? monopolies (Governments) are in no way incentivized to compete and provide services at lower prices. Well, it's a local monopoly. It's kindof like saying "This is the only gas station for twenty miles" but not "this is the only gas station in existance. I think you're also, in my view mistakenly, making the implicit assumption that your taxes equate to services that you would pay the same price for if those services were sold on the free market. Why can't government's tie the services they provide to the taxes they collect? For some things, I'd agree with you. For others... well, there's a good reason for a democracy to fund public education. Stupid people vote, and huge discrepancies in power undermine democracies. The last thing that I want is a police force that funds itself through fines. There's a horrible conflict of interest. Their refusal to do just that is just more evidence of why governments are so inefficient (and why the restaurant analogy is incorrect). ...so a resturaunt with a cover charge, then. Inflation is a sinister tax because it is so difficult, if not impossible, to see. Whereas other taxes are inefficient due to the costs incurred collecting the tax. Inflation is not not only beneficial, in fact it is a necessary monetary tool in order to keep the economy growing. The reason for this unpopular claim is simple: Money (regardless whether fiat or commodity type) is compensation for goods and services produced. However, none of these goods or services have an indefinite life span. All products become obsolete after some time (food rots, cars corrode, computers become technically obsolete etc) while services become worthless even faster. Even the results of scientific research become obsolete after sufficiently many years have passed. Fairness demands that the money paid for these goods and services expires in time as well. This is accomplished by inflation. Fiat money was partly invented in order to have a tool for a timely devaluation of money. It is a serious flaw of gold as money that it does not corrode fast enough in order to be practical as a means of exchange. In more abstract terms: The problem is entropy. Whatever the economy produces eventually ends up in garbage. For this reason, money can not keep its value indefinitely. Its value must decay at roughly the same speed as we turn natural resources and the enviroment into garbage. There is such a thing as deflationary growth. Inflation is not necessary, nor desired.